A recent foray out of the Studio found me in the new and fabulous location of Fancy Tiger Crafts. 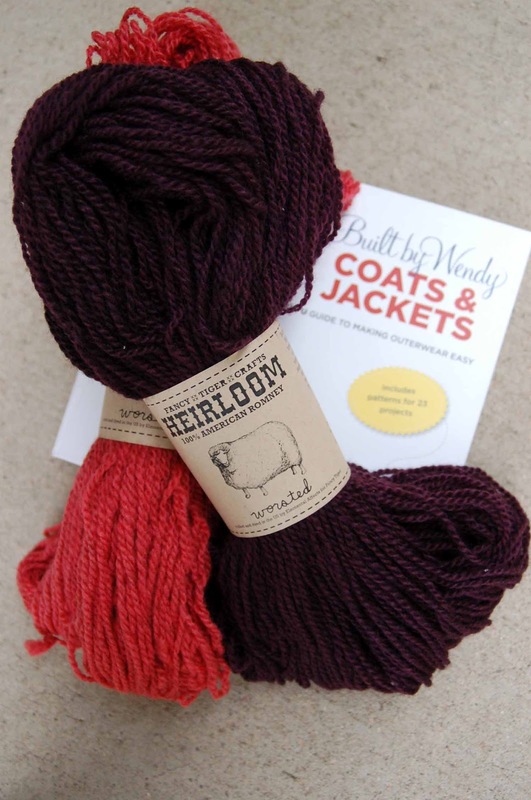 Their own Heirloom Yarn, 100% American raised, spun and dyed Romney wool, called my name . And I added to my library with a sewing book by Wendy Mullin. There is a wide world of knitting geniuses who have graced my knitting journey and passed on gifts of technique and style to my eager hands. The 30 Stitch Swatch is one of those techniques I use and teach for swatching and design. The concept was originally presented to me by Lynn Henderson, a brilliant knitting technician, whose local knitting group I avidly followed in the early 1990's. Since then it has been tested by both unbelieving skeptics and the best knitting minds and it has proven to be a very useful tool, accurate and consistent. And though I love almost every little aspect of knitting and design, doing multiple swatches just to get the gauge is probably my least favorite knitting activity. The 30 Stitch Swatch solves that for me. Most amazing is that this will work not only with stockinette stitch but on all kinds of stitch patterns; I've used it for stranded patterns, cables, lace, to say nothing of our dear garter stitch, and it holds it's own across them all. Numbers tend to get a little wonky in the realm of super bulky yarn and broomstick needles, where inches equal fractions of stitches and the dark powers take over. To be frank, I just don't go there. In the wide range of yarns that I use, from cobweb to bulky and all weights in between, this technique is my faithful and trustworthy companion. I teach this as technique number one in almost all my knitted garment classes and I briefly discussed it in an interview on the Knitmore Girls podcast in 2009. Some things have changed since that interview, I now do the Knitaway® in my Studio, but the 30 Stitch Swatch remains as a treasured component of my knitting tool kit. I present it to you here in my classroom version with the hope that you may find it helpful, too. PS: Do you see the knots in the tail of the swatch pictured above? That's how I keep track of what needle size I used for the swatch; size 7 needle, seven knots in the tail! 30 Stitch Swatch Magic is an amazing and well-tested tool for determining gauge for a knitting project without having to do multiple swatches each time. It has proven to work over all types of stitch patterns and with any yarn. Give it a try and see if it doesn’t make swatching more fun and informative! (one size either larger or smaller), the width of a 30 Stitch Swatch changes (increases or decreases) by 1/2 inch. Cast on at least 30 stitches, adjusting to accommodate pattern multiple; you must have 30 stitches in pattern over which to measure. Work in pattern for 4 inches. Block swatch. Steaming is fine for this. Measure the entire width of the 30 stitches. 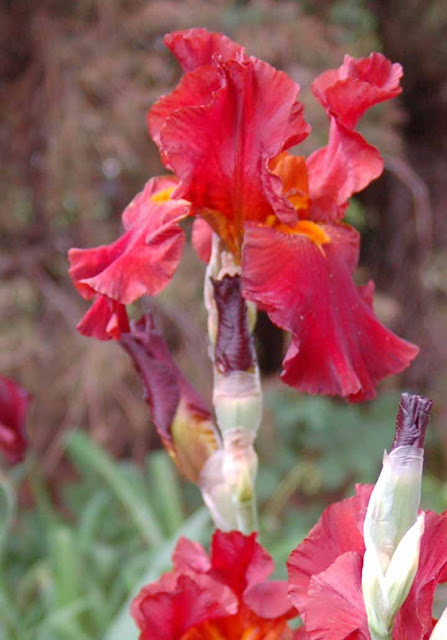 For every needle size changed the width of the 30 stitches will change by 1/ 2 inch. This allows the knitter to extrapolate the gauge that will result by going up or down in needle size. 30 stitch swatch on size 6 needles in pattern measures 5 inches wide. Stitch gauge per inch: 30 sts. divided by 5 inches = 6 sts / inch ; 24 sts /4 inches. By this method, using one size larger needle will expand the 30 stitch swatch by 1/2 inch to 5.5 inches wide. So then, 30 sts divided by 5.5 inches = 5.45 sts per inch (as close to 5.5 sts/ inch; 22 sts /4 inches as one can get). 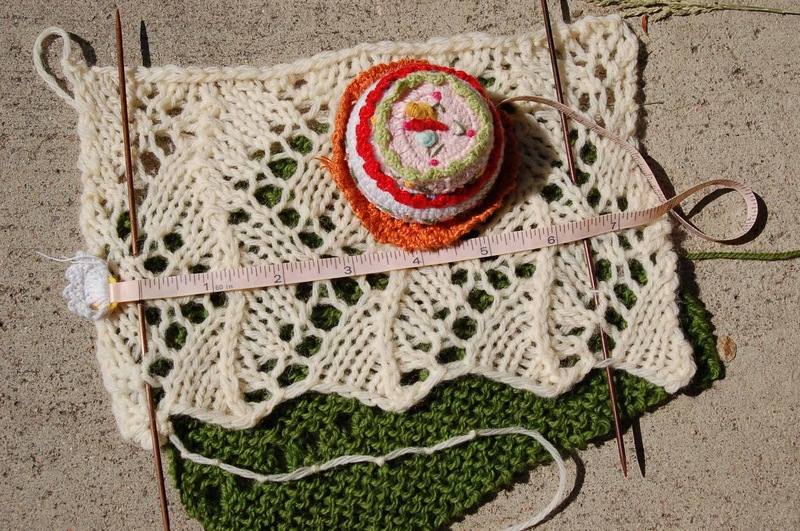 Going in the other direction, if you use one size smaller needle you will shrink the original swatch width by 1/2 inch. So then, 30 sts divided by 4.5 inches = 6.66 sts per inch ( as close to 6.5 sts / inch ; 26 sts/ 4 inches as one can get). To all the beautiful women who love, and hug, and care, and raise the most wonderful children in the world ...Happy Mother's day! You are the very best. The second week of the Knitaway® in the Studio was just as inspiring as the first and produced some interesting technical discoveries. We continued exploring stretchy bind off methods, perfect for the outer edge of shawls. Here are two technique samplers that used the same bind off, a variation I call the Very Stretchy and Beautiful Bind Off, an all knit bind off, inspired by Margaret Stove's Shetland method that we explored in a post last month. Take a look. The light-colored sampler was bound off on the right side and the purple one was bound off on the wrong side (clever Dorothy!). Can you see the wonderful difference? 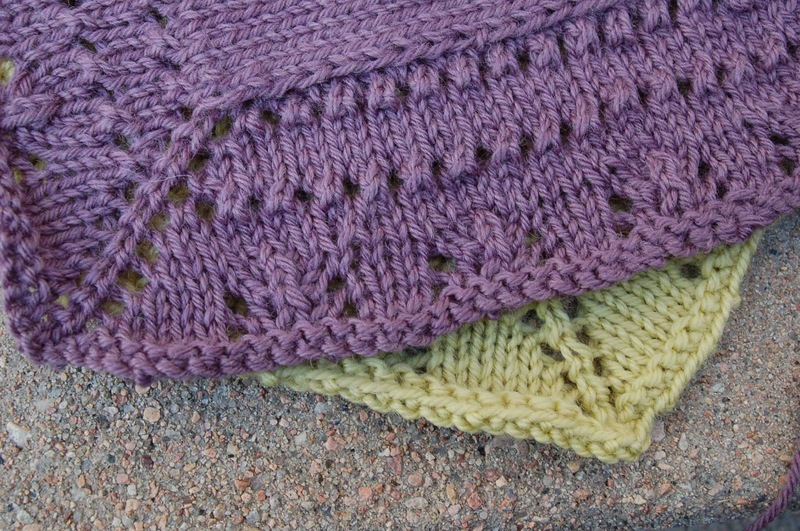 It is suggested that you use a smaller needle (one or two sizes smaller than for the shawl) for this technique as this is a very, very relaxed bind off edge. Knit two stitches, then *insert the left hand needle into the front of the two stitches on the right hand needle (as if doing an SSK), and knit the two stitches together through the back loop, knit 1, and repeat from *. A close up of the two results side by side reveals the magic. 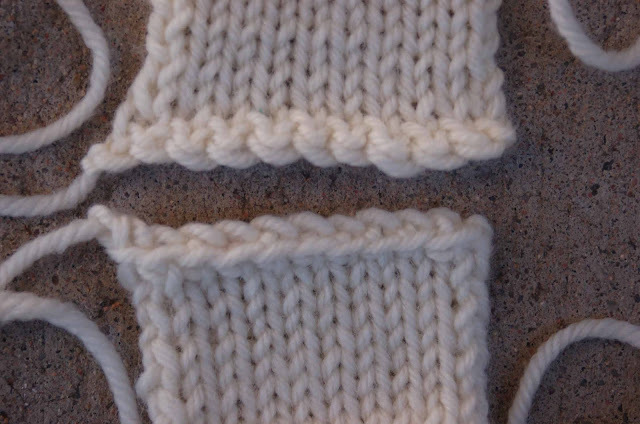 On the top is the wrong-side bind off and below is the right-side bind off. I love them both and will definitely keep these on hand for that special edge. Simple to do, extremely functional, stretchy, and beautiful to boot! Nothing like a fabulous finish.